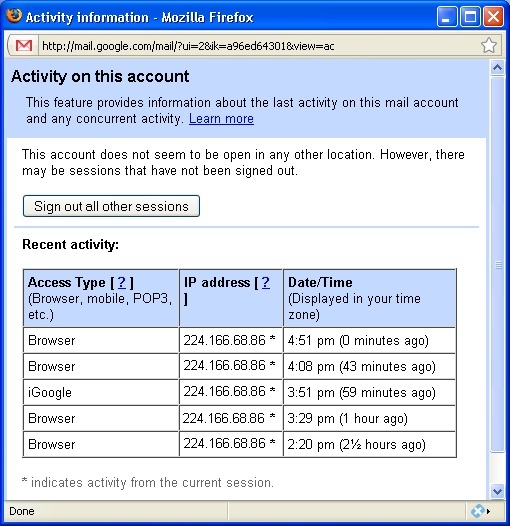 Google helps you manage your account security with more information and the ability to remotely sign out sessions. You may have noticed this link at the bottom of your Inbox. It was added just last month, July 2008. If you click on the Details link, you’ll be presented with another window which offers information about any other sessions that have your account authenticated. This could be if you (or hopefully not, other people) are checking your account through a browser, POP account, mobile device, the iGoogle module, and more. This information will be useful to you if you’re concerned that somebody may have access to your account that you don’t want. If you were using a public terminal, say something at a public library, an airport, or an internet cafe and you accidentally forgot to log out. You would be able to see if somebody was accessing your account besides you (based on the IP address). You can simply use the button at the top of that window and sign out all other sessions. You might pay attention to this page if you’re concerned that somebody has your password and is accessing your account regularly. You could either use this page to catch them red-handed or just be aware of the issue and change your password pronto. Read more about this on Google’s Help Center.